Sebastopol has always been hip, but with the addition of The Barlow Culinary and Arts Center, it’s now got a whole new groove. Downtown is a lot bigger. Just next door to the Rialto Cinemas on McKinley Street, there’s a place to share fine food and enjoy art and wine. In fact, there are at least 38 exclusive experiences to choose from. This is where you’ll meet food producers, wine makers, brewers, distillers and artists. The Barlow is the one of the first business communities in the nation to connect customers with products, the people who make them, and the production itself. What’s more, The Barlow is dog-friendly and family-friendly. There are tree-lined streets, grassy areas, a bocce ball court and children’s play area. Last week, Jack Johnson was hanging out at one of the fire pits, strumming his guitar at Zazu Restaurant + Kitchen. Happily, there’s plenty of parking. This week, I decided to explore the community for myself. I was guided by signs that announced, Treats, Art, Eat–so how could I go wrong? 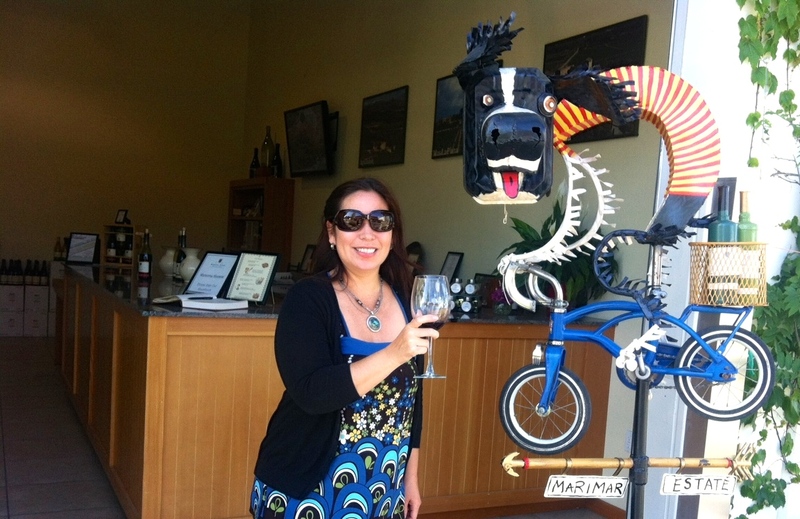 When I came upon a sculpture of a dog riding a bicycle (one of local artist Patrick Amiot’s junk art sculptures), I hung a left into Marimar Estate Vineyard & Winery’s tasting room. Like most of the businesses in The Barlow, they are dog-friendly. That’s good, because in Sonoma County, we’re devoted to our dogs and want to take them everywhere. If I had brought my dogs, the hostess would have given them each a treat. The wine is named after the winery’s English Springer Spaniels, Chico and Bonita. Before I had finished my first taste, I was already thinking happily of how I could now walk my dogs and wine taste at the same time! My favorites were the Pinot Noirs–three different limited-productions were offered on the tasting menu! She’s right. You could spend the whole afternoon or evening here. Not only can you wine taste, you can shop or watch artisans sculpt, and then enjoy a romantic dinner at award-winning, Michelin-recommended restaurant Zazu. For those early birds, begin with some yoga or Zumba at the dance studio move2Change. Or start with a Lavendar Latte at Taylor Maid Farms’ Coffee Bar & Roastery and enjoy the free WiFi. You can watch art created before your eyes at C14 Contemporary Arts, Spiral Fusion Glass Art, Wolfard Glassblowing, and Bronze Plus Art Foundry. If you have to pick up something for dinner, you can’t go wrong with natural foods store Community Market, the Village Bakery and Farmer’s Exchange of Earthly Delights. The goal of The Barlow is to bring the artisans of Sonoma County “out of the woods” and to a place where everyone can see them. That’s happening. For more information or to view the directory, visit http://thebarlow.net or (707) 824-5600. The Barlow is located at 6770 McKinley Street, Sebastopol.